I heard an interview with the author, Alex Epstein, of this book on the anarcho-libertarian Tom Woods podcast. I am nowhere near anarcho-anything but I love contemplating the wild ideas that come out of that corner. Anyways, keeping an open-mind is critical so I dug in. His main thesis is that our standard of value benchmark is to make human life better at the expense of everything else. Fossil fuels have made human lives better, therefore fossil fuels are good. Before I go in to my issues with his thesis I am 100% with him on nuclear energy and he calls out the “liberals” for their unwarranted stance against it. Yes the idea of the black swan event is scary but look at the statistics. 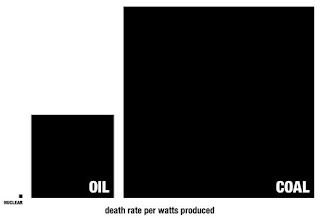 Nuclear power caused deaths on a per watt produced basis are a miniscule fraction of deaths from coal, oil and even solar for that matter. CANDU and underground salt reactors are exceptionally safe and there’s serious promise in even safer thorium reactors. Harnessing nuclear fusion is within our physical limits and would create such an abundance of exceptionally safe energy with essentially no radioactive waste that this topic would be moot. ARE FOSSIL FUELS OUR SAVIOR OR SOMETHING ELSE? The problem with his thesis is that fossil fuels is only a vehicle for and not the underlying mechanism of human flourishing. Industrialization is what has created such wealth and high standards of living. 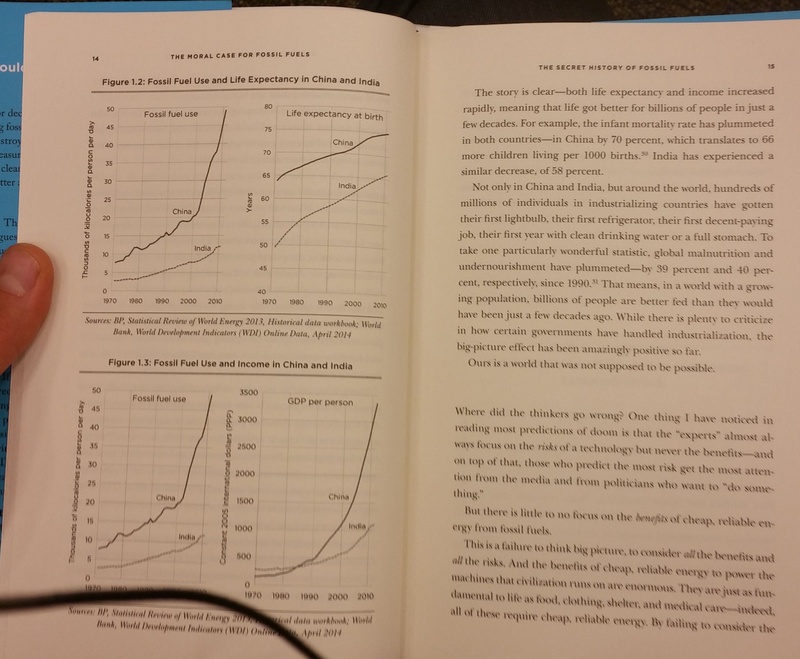 The book would have much more clout if it were called Moral Case for Industrialization. It is the clever harnessing of mechanical energy from potential energy that has transformed the human world. Fossil fuel just happened to be the most convenient (or as Epstein hammers into our heads: the cheapest, most plentiful, and most reliable) modality for this era. We all are very grateful for Industrialization 1.0 but we’re now at a tipping point in technological advances that will allow us to transition to renewable fuels. Industrialization 2.0 will allow continued exponential growth with less downside. I’d give him slack on this but he holds the stodgy opinion that not only should we continue relying on fossil fuels but that we should expand our reliance. It’s almost like he’s doubling down in his convictions as a way to strengthen his argument. Kind of like how some people think talking louder will somehow prove their point. PHILOSOPHICAL DISAGREEMENT #1: Fight fire with fire… FOREVER? He argues we can use fossil fuel technology to “dampen” the effects of any fossil fuel caused climate change at the expense of any non-human entities. For example, build bigger, coal-powered air conditioners for the hotter climate. He says bilge pumps and waders. I say high-tech spackle. I come from the tech world and when we have the resources we always do root-cause analysis so that we can address the root cause. It’s served us well. Band-aids give us a job in the short-term but we can’t be cost-competitive in the long-run. Epstein holds this overly simplistic view of how human life is our standard of value. The way he explains it is it would be best for human life if we paved the world with concrete because it would eliminate disease, bugs, walking on dirt, and pesky bird calls. To “get back into nature”, underground parks would be built with artificial lighting, manicured landscaping, and perfectly controlled climates. On paper in a reductivist’s world, this would be ideal for the modern human. Personally not for me, walking in nature soothes my soul. And interestingly he delineates between human nature and nonhuman nature. Nonhuman nature IS human nature. Humans and the massive amount of bacteria in our stomachs did not evolve in this concrete environment. Our evolutionary stable strategy involved wading through mud, swatting mosquitoes, and building makeshift homes. When you start eliminating species on a quest for the most sterile, “human-friendly” environment there are major consequences in the ecosystems upstream and downstream. Finally, human life in the long run is indeed our standard of value. But it should be about synthesizing human technologies in to our ancestral environment. More of the same for short-term comfort and monetary gains is not what an intelligent species prioritizes. Unknown and known externalities and their effects like CO2 accumulation and climate change are not something as a species we should be gambling with. There will be some pain at first, but that comes with any magnificent challenge worth doing. A great majority of humans are grateful that film photography came to be and gave us movies, a new form of art, and shareable visual memories. But with the technological advances in digital photography there is no valid reason to continue to expand analog film technology other than a few who prefer the nostalgia and visual effect of film. Epstein’s position is like an oblivious, short-sighted Kodak major stakeholder in 2002 who thinks everyone is wrong to increase digital camera use because of all the great things film photography did for us in the 20th century and digital is too expensive and has lousy quality. Yes, at first, digital photography was expensive and quality not so great. This was when the technology was in the initial deceptive growth stage of that oh so lovely exponential curve that is so prevalent in the digital world. We’ve now entered the part of the curve that has allowed digital photography/video to become dirt cheap, compact, and very high quality only within a few years. He devotes a full half-page to electric vehicle technology and summarizes by saying that battery technology is not advanced enough. The laws of physics are in favor of much improved battery solutions with incredible energy densities and charge/discharge rates. 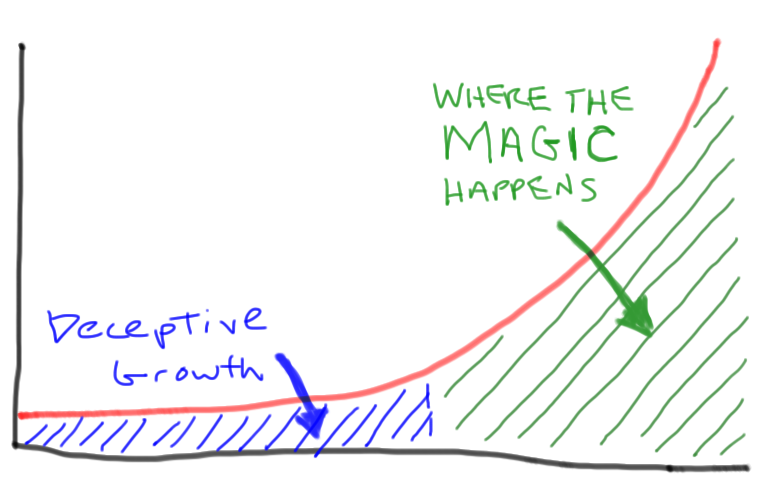 This is another situation where deceptive exponential growth comes in to play. The economics and technology have not been in favor up until the early 2010’s to invest in solutions but things are changing very quickly. Prices are coming down and there is a great race to solve the battery problem. It’s an exciting time in the industry! I will only touch for a moment on how electric vehicles are a much more elegant solution to internal combustion vehicles. There are much fewer moving parts, less maintenance, noise, and much more efficient power conversions both in terms of less energy lost to heat and electric motors are highly efficient at 90% of the operating RPMs. This is most evident by the Tesla Model S P85D vehicle. Tesla Motors just started releasing electric vehicles in 2006 and they already have a vehicle that goes from 0-60 in 3.1 seconds and can hold seven people. This is super-car performance in a large sedan form factor. Just search Youtube for “Tesla Model S P85D” and watch it blow away gas vehicles from Lamborghini and Ferrari that have had almost one-hundred years to optimize their internal combustion engines for performance. It also has the safest rating possible and is the highest rated vehicle Consumer Reports has ever tested! This is only just the beginning! I sound like a broken record but again he underestimates the power of the exponential curve and the effects of scaling. The more solar is used and built, the cheaper it gets. This can not be said for coal, oil, and natural gas. 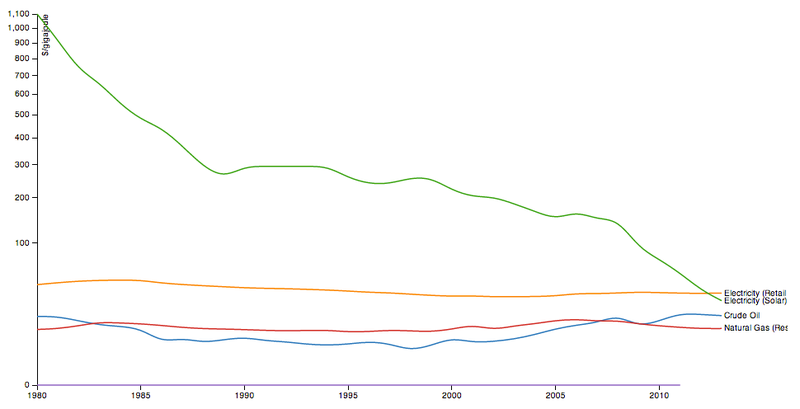 And you can clearly see this in the below chart from this Solar Energy – Disruptive Technology article. 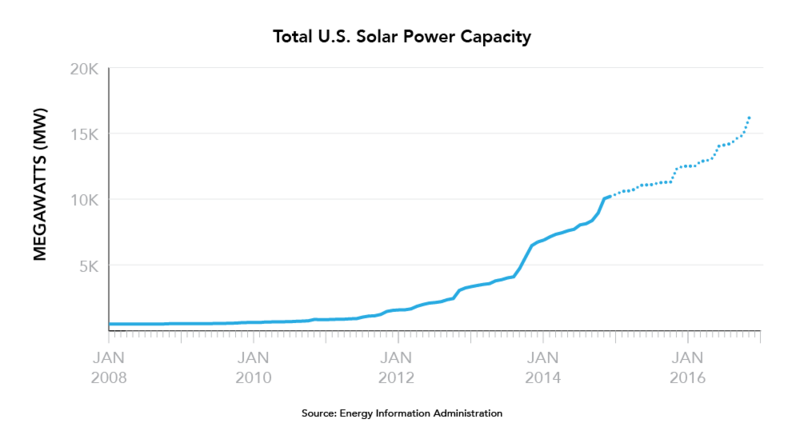 Solar capacity graduating from deceptive growth to where the MAGIC happens! Notice the time scale is over only 9 years! Before 2011, capacity looked forever helpless. At the moment the percentage of energy from solar is small but the wonders of exponential growth will make this not the case shortly. Just think about the concept that if you start with a penny and double your total amount every day you will have over a million dollars after thirty days. We are talking the same principle here. Right now we have sixteen cents and in just a dozen proverbial days we’ll be banking! Another argument he states is that solar can’t handle base load and that cloudy days and nights limit it’s reliability. Molten salt storage is actually making concentrated solar a viable base load power source and solves cloudy day and night demand. And such a power plant will be coming online soon. This will take a while to scale and we should continue to use coal and natural gas plants as base load until the technology is mature enough. He relies on these really compelling charts showing correlated curves between fossil fuel use and variables like life expectancy and GDP. But he does absolutely zero explaining of how fossil fuel use increases these values. One could surmise that indirectly fossil fuels (ahem, industrialization) freed up time to improve on these problems, but I want him to explain the causation. It’s just lazy. I could just as easily throw in similar charts just by Google Image searching for “exponential growth chart”. Oh look national debt growth correlates with fossil fuel use… so what? Finally, he claims that anti-fossil fuel people would prefer fossil fuels never were touched. I don’t know what sane person isn’t appreciative for advances in medicine, transportation, and the world in their pocket gained from the post-steam engine age. It’s also odd how he takes it personally that people don’t thank every coal worker, oil driller, and petroleum engineer as they are making life good for all of us. It’s not like they are volunteers with some altruistic mission. Many jobs in the industry require few skills and get paid handsomely and the high skilled jobs get compensated higher than similar jobs in other fields. There were other issues with his arguments along the lines of battery storage, wind, and his general resistance of change to superior technologies. I’d give the horse / car transition story here but I don’t think it’s necessary. I don’t agree with your precautionary emphasis on CO2. As Epstein clarifies in the book, the value to humanity (the pros) simply overwhelms the negatives. Billions of lives depend upon fossil fuels and billions of lives will be made appreciably better as we use more of it. And when alternatives are cost effective we will naturally gravitate to them (of course this may reduce demand, lowering price on fossil fuels and actually leading to more use in dirtier contexts). Beware unanticipated effects. I suppose you are right that he should have built a more rigorous argument on how fossil fuels impact living standards and life expectancy, but does anyone doubt that the argument can be easily made? Coal may not have been a sufficient explanation to the industrial revolution and the great enrichment which followed, but It was clearly a necessary ingredient to the steam driven factories, ships and railroads which connected us together in a massive network of decentralized cooperation, production, specialization and exchange. Petroleum and natural gas and nuclear just continued the gains. My guess is that the world will be a little warmer, a lot better and orders of magnitude more prosperous by the turn of the century. However, we should continue to pursue unbiased research into new technologies, better models and better solutions. Yes fossil fuels make life better for all in the short-term but the externalities it creates rob humanity in the future. If true long-term costs of fossil fuels were baked into prices (thus eliminating the moral hazard), then renewables would beat out fossil fuels if not now– very soon. RUMURPHY what about his comments that fossil fuels reserves are enough for many centuries?